Hugo Chávez, the irascible president of Venezuela, is sticking it to the Bush administration in a big way by offering free eye surgery, bus passes and heating oil discounts to needy Americans. Mr. Chávez is exporting his “Bolivarian revolution” to Chicago and Milwaukee, as the White House grapples with how to tackle his increasing appetite for military hardware and his love for Fidel Castro. It’s an awkward situation for Milwaukee Mayor Tom Barrett who appeared ready to sidestep the White House’s intense dislike for the leftist leader and accept the offer in some way, according to the Milwaukee Journal-Sentinel. Mr. Chávez plans to fly needy Chicago and Milwaukee residents to Carora, in Lara state, for free eye surgeries to be done by Cuban doctors. Patients from two dozen countries, mostly in South America, will also participate. Citgo Petroleum Corp. has already given 16 million gallons of heating oil at a steep 40 percent discount to 181,204 low-income households in Connecticut, Delaware, Maine, Massachusetts, New York City, Philadelphia, Rhode Island, and Vermont. When city or state governments refused to deal with Citgo, a subsidiary of Venezuela’s state oil firm PDVSA (Petróleos de Venezuela, S.A.), the company worked with community groups. In Chicago, Citgo offered free bus passes to low-income residents, the Journal-Sentinel said. For an administration that has trouble ‘winning the hearts and minds’ of Iraqis, Mr. Chávez’s approach is more annoying than anything else. During the abortive 2002 coup to topple the former paratrooper, the U.S. openly endorsed the coup plotters. Then-U.S. Assistant Secretary of State for Western Hemisphere Affairs Otto Reich, member of a dying generation of anti-Castro Cubans, even floated rumours that Cuban troops were trying to reverse the short-lived coup, The New York Times reported at the time. Publicly the White House points its finger at Mr. Chávez’s shopping list that includes 100,000 AK-103 assault rifles, 24 brand-new Sukhoi-30 [SU-30] fighter jets and 15 helicopters (6 MI-17, 8 MI-35 and 1 MI-26) from Russia. Moscow is also negotiating a deal to build a Kalashnikov factory in Venezuela. An earlier deal with Spain included 10 C-295 transport planes, 2 CN-235 patrol planes, four coast guard patrol boats and four frigates. A cause for concern? Not really. The U.S. used to sell Venezuela arms, but it has now decided that the anti-Bush, pro-Castro president no longer deserves to buy parts for its aging fleet of Made-in-USA jets. Colombia? Venezuela has been accused of supporting and sheltering different rebels groups fleeing Colombian President Ãlvaro Uribe’s crackdown. The strength of the Revolutionary Armed Forces of Colombia [FARC] and the smaller National Liberation Army [ELN] has been waning. And the days of 19th and 20th Century open warfare in South America are also over. Mr Chavez has a few screws loose. What does he hope to accomplish by giving heating oil to poor Americans? But it does say something about our gov, that another gov should be feeding our poor when our gov is off feeding the poor of other countries. go figure. I think the best way to deal with Hugo Chavez is for America to become a conservationist-minimalistic society. Especialy amongst the low and middle-class of our society. In doing so we might be able to accumilate some savings. Our obsession with materialism and consumerism is making it virtualy impossible to save and accumilate wealth, especially for future needs. If we can practice conservationism and minimalism and at the same time reduce our obsession with materialism and cosumerism, most of us would be able to save for the future. Nothing creates more financial security than saving. 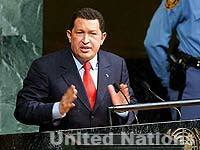 These fudamental ideas I enumerated above would make it difficult for guys like Hugo Chavez to take advantage of us. Materialism and consumerism is what fuels his political ambitions. If we get behind conservationism and minimalism as a nation we can beat Hugo Chavez at his game, without Uncle Sams help. Most of the problems in our society should tackled by each and every one of us. Demacracy is predicated on the will of the people to take full responsibility for their actions. Now lets use our will to stop Chavez.